John Mercer Ward was born in Ossett on the 22nd February 1888 and baptised at the Zion Chapel, Gawthorpe on the 21st March 1889, the son of Gawthorpe miner, Oliver Ward and his wife, Annie (nee Mercer), who were married in 1882 at Ossett. The Wards had four children: Emily, b. 1883; Harry, b. 1888; John Mercer, b. 1889 and Joseph, b. 1897. All the children were born in Ossett. In 1891, the Ward family were living in Jack Lane, Ossett and by 1901 Oliver and Annie and their four Ossett born children, aged between 4 and 17 years, have moved to live at 18, Cross Street Ossett. In 1911 John has moved away from the family home in search of employment and he is working as a miner in Featherstone, but lodging with a local family. Private 201039, John M. Ward of the King's Own Yorkshire Light Infantry embarked for France on 15th August 1915 and thus qualified for the 1915 Star in addition to the Victory and British medals. His army service record has not survived. The Territorial 1/4th Battalion of KOYLI was formed in August 1914 at Wakefield as a part of the 3rd West Riding Brigade, West Riding Division. They moved on mobilisation to Doncaster and in November 1914 to Gainsborough then on to York in February 1915. On the 12th of April 1915 they landed at Boulogne and on the 15th May 1915, the formation became 148th Brigade, 49th (West Riding) Division. Private John M. Ward was killed in action on the 21st July 1917 aged 28 years. On the 13th July, two KOYLI battalions marched from Annezin to Bethune station to entrain for Dunkerque, where they arrived in the course of the afternoon. They proceeded in barges to Zuydecoote (spending the night in the barges.) Next day they marched to Bray Dunes, taking over some of the coast defences there. On the 18th July, a week after the 2nd Battalion had experienced their hard fighting there, both Territorial battalions (1/4 and 1/5) were in occupation of the Nieuport defences. The 1/5th Battalion were in front line with the 1/4th Battalion in support. The former had several casualties in its “A” and “C” Companies on the 18th July. On the 20th July, there was again a destructive bombardment. A day or two later, a heavy bombardment descended on the defences in the night of the 21/22nd July 1917. The enemy used shells of all calibres and included a large quantity of his new (mustard) gas shells. The 1st/4th Battalion, in support, were the chief sufferers. The gas attack was repeated twice. The gas smelt of garlic or mustard, and was the chief cause of an overwhelming number of casualties. The immediate effect was a slight irritation of the nose and throat. Sneezing ensued, followed by vomiting, and the eyes became acutely inflamed and very painful. Coughing and symptoms resembling bronchitis followed and prevailed for a week, at least, after contact with the gas. In the 4th Battalion the casualties were 7 killed, 9 wounded, 423 gassed and 3 missing. 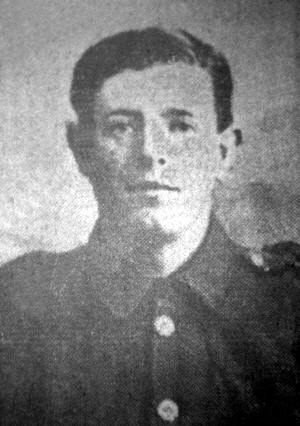 Private John Mercer Ward was one of those killed. In the 5th Battalion the total casualties for the period were 39 killed, 12 died of wounds, 3 missing, 153 wounded and 124 gassed. 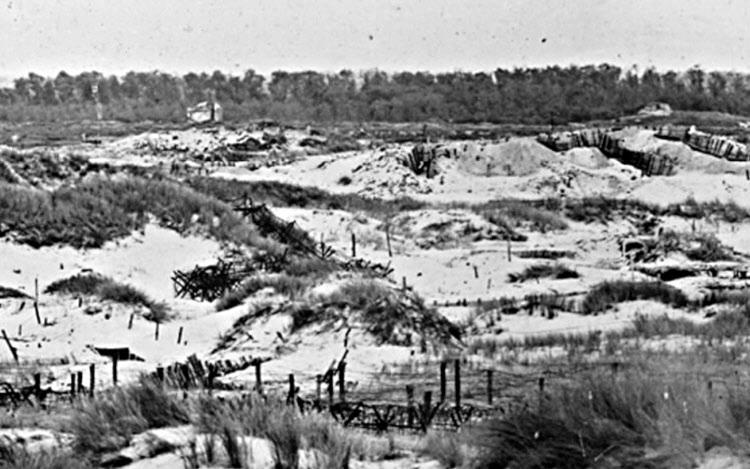 Above: German positions on the dunes around Nieuport on the Belgian coast, between Ostend and Dunkirk, where heavy fighting took place in July 1917. Private John M. Ward died on the 17th July 1917 at the age of 28 years and is buried at grave reference I. L. 33. at the Coxyde Military Cemetery, 2 Koksijde, West-Vlaanderen, Belgium. Coxyde Military Cemetery is located approximately 500 metres beyond the village of Koksijde on the N396 towards De Panne. n June 1917, Commonwealth forces relieved French forces on 6 kilometres of front line from the sea to a point south of Nieuport (now Nieuwpoort), and held this sector for six months. Coxyde (now Koksijde) was about 10 kilometres behind the front line. The village was used for rest billets and was occasionally shelled, but the cemetery, which had been started by French troops, was found to be reasonably safe. It became the most important of the Commonwealth cemeteries on the Belgian coast and was used at night for the burial of the dead brought back from the front line. The French returned to the sector in December 1917 and continued to use the cemetery, and during 1918, Commonwealth naval casualties from bases in Dunkirk (now Dunkerque) were buried there. After the Armistice, the remains of 44 British soldiers were brought into the cemetery. Ten of them had been buried in isolated graves. Nineteen came from Furnes Road British Cemetery, Coxyde, a cemetery made in July, 1917, by the 2nd Manchesters and the 49th (West Riding) Division on the East side of the road to Furnes (now Veurne). Twenty-five (of whom 22 belonged to the 49th Division) came from Oosthoek Military Cemetery, Adinkerke, 4 Kms South-West of Coxyde. The cemetery now contains 1,507 Commonwealth burials of the First World War, the French graves from this period having since been removed. Of the 155 Second World War burials, 22 are unidentified.